Crowds in the new land will be a mess, and likely will spill over into the other thrill-style rides at that park. While I don’t see much impact on the other parks, no one knows for sure, and the Labor Day weekend that immediately follows opening day will likely be the busiest such in Disney World history. I don’t see a huge impact outside the land itself the rest of the month, as it is hard to take kids out of school in September, the partial opening will make visiting specifically to see Star Wars less attractive, and many people will cancel their September trips to avoid the mess entirely. See this for more. WHAT IS SEPTEMBER LIKE AT DISNEY WORLD? September at Disney World combines low crowds with low prices, and typically also has nice deals as well. This makes it a great month for returning visitors. But it has lousy weather, combining continuing summer heat and humidity with the peak of the hurricane season, making me not so keen on the month for first time visitors who may never return. On a crowd scale of 1-11, the first week of September I have revised to 5/moderate minus, because of the Star Wars opening. 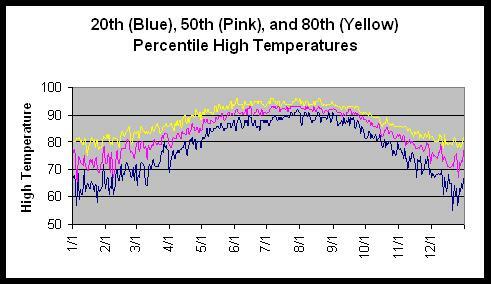 The other three full weeks of the month remain in the low range, but I have bumped them up a bit for both the effect of Star Wars: Galaxy’s Edge, and my recently-completed analysis of 2019 fall breaks. September 2019 Disney World ticket prices are set at among their lowest levels of the year much of the month. 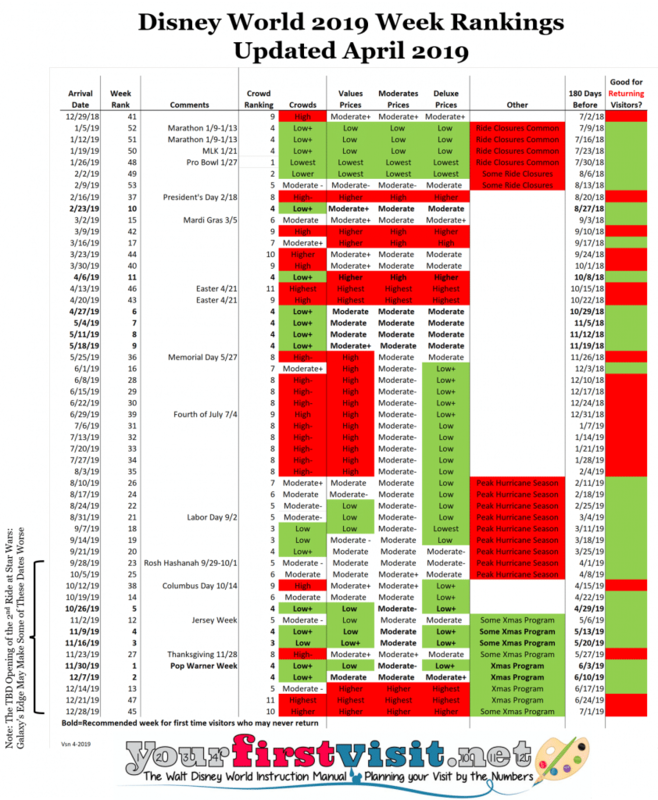 See the image–where green is good, and lots of green particularly good, and red is bad, and lots of red is particularly bad. 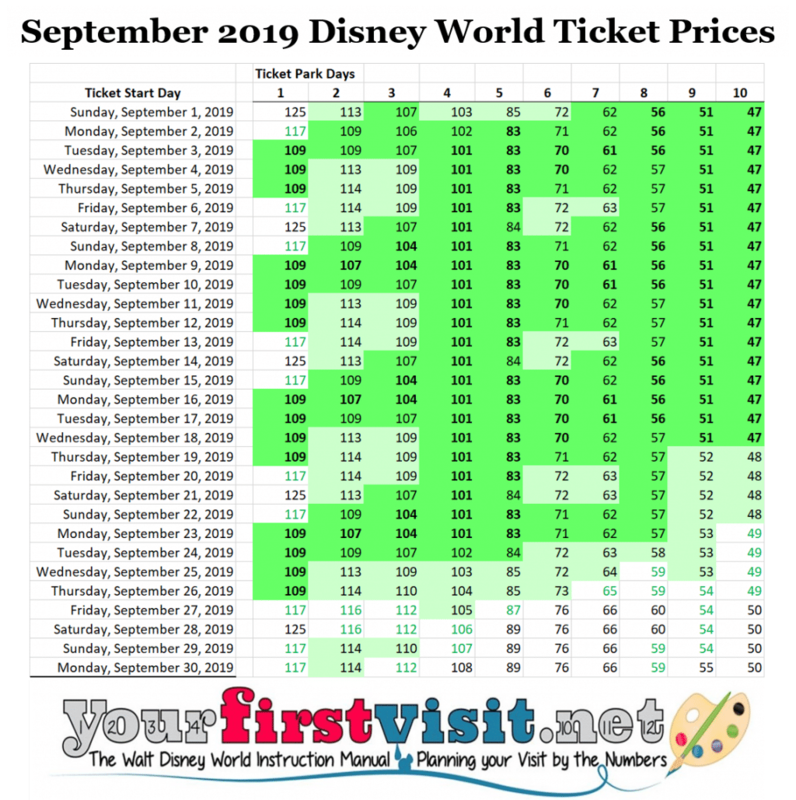 For more, see my Disney World 2019 ticket price calendar. Deals for the general public are available for September 2019. You can find them here. September weather at Disney World is hot and humid, with afternoon storms common. The hurricane season officially begins June 1, but hurricanes a rarely a threat until mid-August. The peak of the hurricane season begins then. All of September is in this period. Mickey’s Not-So-Scary Halloween Party kicks off August 16, 2019 and continues many nights in September. See this for more. The 2019 Epcot International Food and Wine Festival will likely kick off August 30 and continue into November. I expect as a result of all this for World Showcase in Epcot to be particularly packed, especially on weekends, on evening Extra Magic Hour nights, and on nights that Magic Kingdom closes early for the Halloween Party. These calendars can be found by clicking this link. Hi Dave! We arrive 9/24 and depart 10/2. We have 3-day park hopper plus tickets and want to visit AK, Epcot, and HS. What days might be best for each park? Thank you for your help! Hi Caitlin, I’ll be glad to help, but can’t be accurate until after DIsney’s calendar for then comes out, in early April, so ping me back then, OK? I can also give you a pretty good guess as a starting point in a week or two if that would be helpful. Hi Cinthia, Disney’s calendar for your date isn’t quite out yet–it will be in about 5 days–so ping me back then, OK?? Hi Dave, first time going to WDW with my family from 9/4-9/11. I also wanted know about which parks to visit when. Hopefully you can help in a couple of weeks! Hi Jessica! Disney’s calendar for then won’t be out until mid March, so ping me back then and I can help. If you need some forecasts before then let me know. I don’t know if this is really a question …. maybe a statement/question. We will be at Disney 9/14/19 – 09/18/19. Normally I can never get into Be our guest restaurant. So today at 11am not even at 6am I thought what the heck I will look (we aren’t doing free dining) so wasn’t up early to try to get any dining figured we would just wing it this year. Well holy cow every day I looked at Be our guest, Cinderellas royal table and Chef Mickey all had availability !!!!! 9 years straight this has never happened at any popular place with out me being up at the crack of dawn or trying every day up to our arrival date. Questions : WTH is that about?? You think this is because of star wars or you think people are cancelling waiting out until all of star wars opens. Lisa, fascinating! The short answer is I dunno. Can’t rule out a glitch or a technical error, and ADRs did just open for those dates. 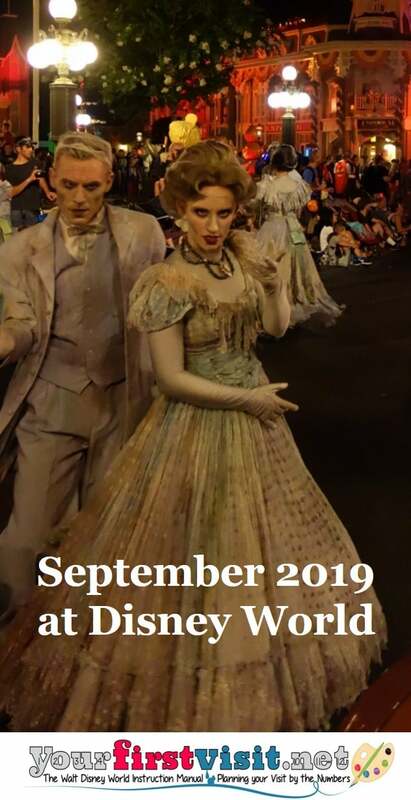 The longer answer is that while many talk about people delaying their Disney visit until Star Wars opens, there’s also a vast number of people who purposely picked September and other dates with the intent of avoiding the whole mess. My guess is that a ton of such folk cancelled their trips, and thus aren’t trying to get ADRs, etc. This is why my forecasts say things like “Galaxy’s Edge and the adult oriented rides elsewhere in HS will be a hot mess, but the rest of the parks won’t see much effect.” Many people are planning their visits around the opening of Star Wars–some to be there, and some to avoid it. The balance of the two groups (plus some subtleties, like how many are coming solely or principally for Star Wars vs to have a “usual” trip and Star Wars too) is what will result on the overall impact resort-wide. It will be interesting for sure!! Pack a spare alarm clock, Lisa! Our trip is 9/14-9/21/19. So confused now that our trip will be AFTER Galaxy Edge opening ( who would have thought it would actually open early!!?). Could you please give us some insight on which park to visit each day? We can hop if necessary as we purchased APs. Hi Claire! yup that was a shock! No one knows what HS crowds will actually be like–I think they will be OK except in Galaxy’s Edge itself, as noted here. The final EMH schedule at HS may change things a bit, so for now I am going to say avoid it except on days MK is open late. Hi Dave, we are going to WDW 9/15-9/21. We have a 2.5 year old. We went the week before xmas last year and didnt enjoy MK at all. Just trying to figure out what we should do at each park, spend the whole day, what to make sure and see. Hi Melissa, those are excellent day choices! All the touring plans on this site are for much longer visits with much older kids. 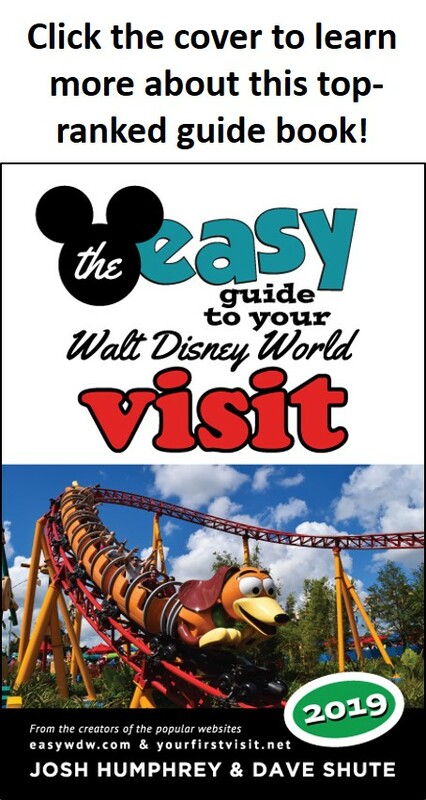 But in my book you can find one day touring plans for each park, some optimized for youngsters. Frankly, with a child that young, I would skip the Halloween party. It is very expensive, and you get the most value from it by staying late. Is there any way to get maps to download so that I can highlight and plan things out? Melissa, my co-author Josh has maps on his site in PDFs. 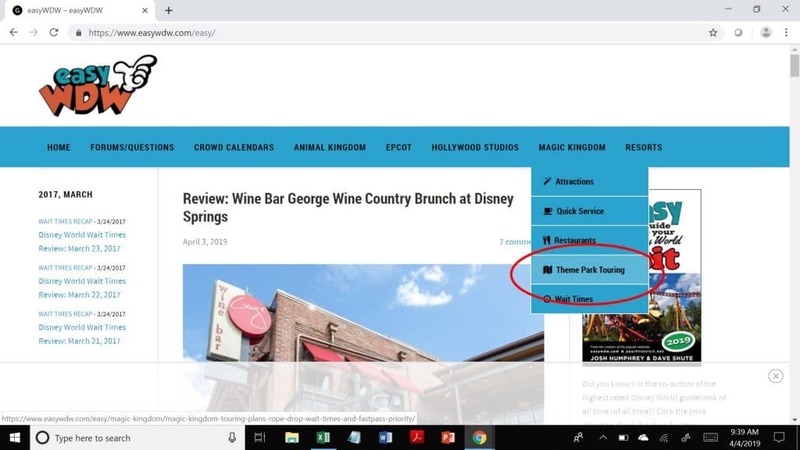 Go to his home page, hover over the parks, and click “theme park touring.” A PDF that includes maps will be available on those pages. Do you think it would be better to go to Disney world from 9/14 – 9/21? Or would it be better to go from 9/21 – 9/28? Which parks should we go to on each day? I have a feeling Star Wars is going to cause much bigger crowds, hopefully just for Hollywood Studios though. Hi Anissa, the earlier dates, partly because more kids are on break at the end of the oth, and partly because Epcot’s nighttime show will have its last run on September 30, and some will come in just to see it one more time. Day forecasts are a bit up in the air until the Star Wars schedule–especially Extra MAgic Hours–becomes clear. For my overall thoughts on the implications of the opening for the other parks, see this.